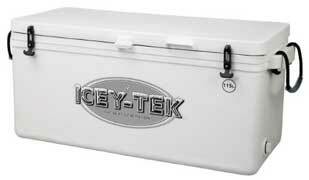 We are a distributor for Icey-Tech Coolers. Why do you want an Icey-Tech Cooler? Thermoplastic Latches - these thermoplastic elastomer, state-of-the-art latches, are non-corrosive non conductive & UV resistant. These latches are used on all our boxes, tested to 120 lb pressure on tie-down points. Rope Handles - Icey-Tek is the only company using rope handles on all long boxes. This minimises the amount of bending required when lifting heavy weights and allows more than two handlers per box, at one time. Heavy Duty Hinge System - Icey-Tek has eliminated internal lid restraints by self-locking multiple heavy duty hinges. These hinges are plastic welded to the box and doubly fixed by six stainless steel screws. Insulation Icey-Tek is powered by pressure injected, medium density, ICI polyurethane. The 35mm walls, floor and lid, ensures ice longevity of up to 12 days using block ice. Even NASA has tested & used Icey-Tek boxes for their insulation qualities! Food Grade Liners - Icey-Tek utilizes approved food grade white liners in all boxes. This eliminates food odors and tainting, giving easy cleaning and low maintenance. Rubber Sealed Lids - To achieve maximum ice retention, the lid perimeter has 3mm rubber seals attached. Dual Bungs - All Icey-Tek boxes have a dual 25mm bung system. This allows the user easier drainage of the box in many different situations.